This article gives you complete details about Daniel Vettori, best allrounder in the world. More details about the biography, profile and career performance of Daniel Vettori are quoted in this article. Read the article full for more details about Daniel vettori. The full name of Daniel vettori is Daniel Luca Vettori. Daniel Vettori is one of the best All rounders in the world. Daniel Vettori is a best left arm spinner from New Zealand. 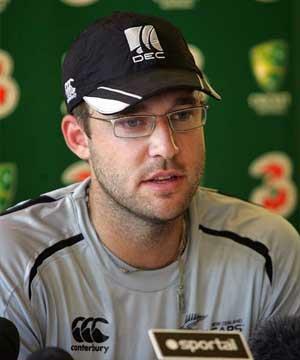 Daniel Vettori was born in the year 1979 January 27 at Auckland, New Zealand. Daniel Vettori had taken 300 plus wickets and more than 3000 runs in test cricket. Daniel Vettori is the curent captain and contracted for Royal Challengers Bangalore IPL team. Daniel Vettori was a left handed slow spinner and a left handed middle order batsman. Daniel Vettori made his test debut in the year 1997 February 6 against England and his ODI debut was against Sri Lanka in the year 1997 March 25. Daniel Vettori is the leading wicket taker for New Zealand. He had taken 10 wickets hauls 3 times in test match cricket. His IPL debut was against Rajasthan Royals in the year 2008 and T20 debut against Kenya in the year 2007. Daniel Vettori had taken 353 wickets in test cricket and 282 wickets in ODI cricket. His best bowling in test cricket is 7 for 87 and 5 for 7 in ODI cricket. He was also a best batsman in New Zealand. He had scored 6 centuries in test cricket and a total of 4238 runs. Daniel vettori was also a successful captain for New Zealand from 2007. More details of the profile and career performance of Daniel Vettori in Test and ODI cricket is given below. This article is about the famous cricket allrounder from New Zeland Cricket Team. As one of the most profilic player for New Zealand in One Day International Cricket, he has also plays in the Test Cricket for the country. Here is the complete biography, profile and career of this player. This article is about the former New Zealand cricketer - Glenn Turner, who is regarded as one of the most prolific cricketer from New Zealand and has an excellent batting record in First Class cricket. Here is given the profile, cricket career and records of this great player. This article is about a former fast bowler of New Zealand cricket Team in 1960's and 70's. We are talking about Richard Collinge. With a height of 6 feet 5 inches, he played in 35 Tests for New Zealand and was the highest wicket taker from New Zealand in Tests at the time of his retirement. A detail profile, career and records of this player are given here.